I had placed my house on the market for 6 months and didn’t have one offer to purchase I decided to change Realtors to Kristin who came recommended by family and Kristin sold my house after the first open house it was on the market for 5 days and because of her recommendations to me my house was sold for more than the asking price. 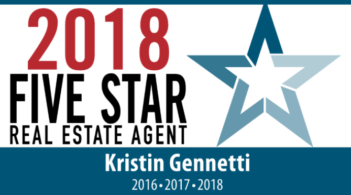 Kristin was very helpful in letting me know what people look for and expect when buying a home and her photographs of my home were amazing and encouraged people to visit the open house. My life was made so much easier because of Kristin and all her help. Anyone who hires Kristin will never be disappointed. Thank you again Kristin Gennetti Aylward.